Dr. George Rector is a board-certified obstetrician and gynecologist and has been practicing for more than 30 years. Currently, he sees only initial OB patients and primarily provides gynecology services. He enjoys caring for the whole patient and her needs and all aspects of women’s care. Dr. Rector earned his medical degree from Eastern Virginia Medical School in Norfolk, VA. He then completed his internship and residency at Franklin Square Hospital in Baltimore. Dr. Rector is currently a preceptor with EVMS and Liberty University. 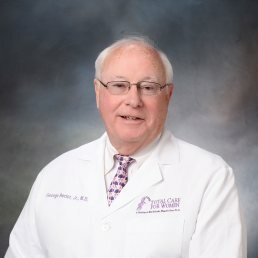 He was previously Chief of the Department of Obstetrics and Gynecology at Chesapeake Regional Medical Center and past president of the Chesapeake Medical Society.